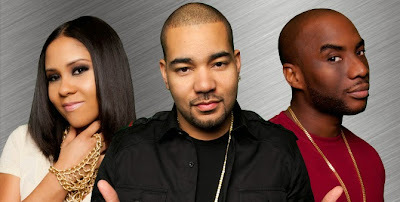 The Breakfast Club with Charlamagne tha God, Angela Yee, and DJ Envy has added 103.5 The Beat Miami to their list of stations carrying the weekday morning show from 6-10:00 a.m. The Breakfast Club also airs on 103 Jamz in Norfolk, V100 in Milwaukee, HOT 98.3 in Tucson, and 106.5 The Beat in Richmond. The Breakfast Club is set to roll, along with a full roster of DJ's at The Beat, ready to capture the Hip Hop Urban listeners in Miami. 103.5 The Beat has wasted no time in adding on air personalities to the station. The station which launched less than a month ago has a full schedule of DJ's on air. Most newly formatted stations wait several months to get settled into the market place before bringing in their on-air staff. Not the case here. Returning to Miami is K Foxx, formerly of 99 Jamz where she co-hosted a show with DJ Khalid. She of course was with the Hot 97 morning show in New York, and has been pretty low key ever since being let go earlier this year. T-Roy is live at nights, however you will also hear him in other markets as well in afternoon drive, early evenings and at night depending on the city.